If you are a parent, you probably associate the word "Melba" with that dry, crisp, thinly sliced toast that is often served with soups. Many of us also used it to help our children's first teeth poke through their gums. Well, that kind of Melba is NOTHING like this dear, sweet kitty. This Melba is more like that fabulous dessert invented in the late 1800's. The Peach Melba is a dessert of peaches and raspberry sauce with vanilla ice cream. The dish was invented by the French chef Auguste Escoffier at the Savoy Hotel, London, to honor the Australian soprano Nellie Melba. In 1892, Nellie Melba was performing in Wagner's opera Lohengrin at Covent Garden. The Duke of Orléans gave a dinner party to celebrate her triumph. For the occasion, Escoffier created a new dessert, and to display it, he used an ice sculpture of a swan, which is featured in the opera. The swan carried peaches which rested on a bed of vanilla ice cream and which were topped with spun sugar. In 1900 Escoffier created a new version of the dessert. For the occasion of the opening of the Carlton Hotel, where he was head chef, Escoffier omitted the ice swan and topped the peaches with raspberry puree. Our Miss Melba is a quiet, shy girl, nothing showy or spectacular, just a sweet, creamy lap full of loving. Melba enjoys the simpler things in life: watching the world go by her window seat, the crunch of a little kibble, a warm sunbeam on the floor ( maybe a a little bit of vanilla ice cream?). Then, like those raspberries in the dessert, BAM - out comes the toys & feather wands and Melba's sassy side comes out! 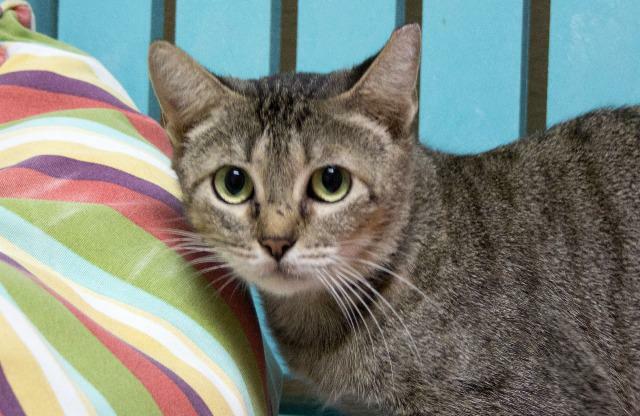 To meet this little bundle of lusciousness, stop into Cattery #2 and ask for the sweetest thing on the menu.